Cupcakes 'n Daisies: Patterns . . . . . 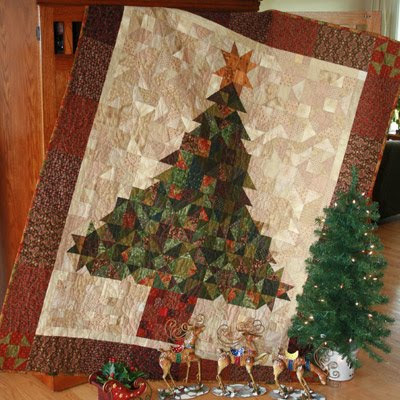 This is "O Christmas Tree" by Nancy Davis Murty at Bee Creative Studio. Lisa/Stashmaster found this pattern over the weekend. It's 60" X 69". It is comprised of 5 rows, each row using different blocks. I love how it looks. I'm glad I've finished my "Oh Christmas Tree", I would have a hard time deciding which one to make, I think they are both amazing. 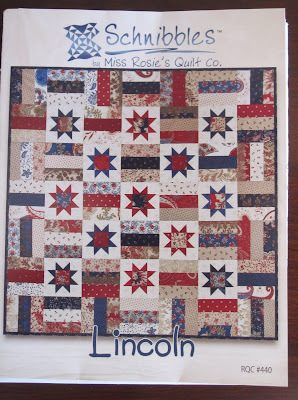 Lisa's blogging about this pattern today, go check it out. I got my January Schnibbles pattern, "Madeline". I like the size of this one, 28" X 28". I hope I get to it, although I don't think I'll use Rouenneries. 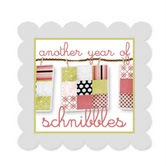 I wonder if there will be a prize for buying all the patterns for "A Year of Schnibbles"? So far I've made 2, skipped one, intend to make one, and am waffling on another, but DO have all the patterns. While I was shopping for "Madeline", "Lincoln" caught my eye, I wonder if Schnibble substitution is allowed, me being from the Land of Lincoln and all. If this one is selected I'm on it! And even though I've yet to tuffet, I plan to tuffet, and now I can tuffet some more. Here's a pattern I ran across the other day in my sewing room. I've had it over a year, I think I need another red and cream quilt, don't you? I could make it from the scraps of my "Red and Cream Snowball Challenge", "Father's Fancy", and "Myths of Avalon" quilts. Here's a link to Tara's blog, the designer of Turkey Red. This isn't a pattern but something I felt I must share. Remember the daily cupcake calendar Rene was sweet enough to send? Well I've been enjoying each and every day, here's an example of the yummy cupcakes I get to look at all day long. I may actually make this one. Saturday and Sunday said to add raspberries or almonds to this recipe.....yum! YUMMY! Chocolate Mud cupcakes...I haven't started my Madeline yet...I'm doing it in Valentine fabric(as soon as it arrives)...I think it will be fun. Oh yes you need another red and cream quilt! Yummy cupcakes. Oh I miss cupcakes (I'm celiac). I'm still waiting for my Madeline. I think Lincoln is very nice, and I'd be surprised if it didn't show up one the months. I haven't gotten Sweet Liberty yet...yet lol. Madeline would look sweet in Valentine's colours, maybe pink, red, and purple? With so few colours to replace in the original pattern really any combo would work. Cute post...there just might be something along the lines of a Schnibble substitution in a couple of months! Love the mud cupcake - YUMMMMMM! OMG that cupcake looks so yummy. It's a good thing I didn't know that was in there or I might have kept the calendar. Are there recipes included in each day? That might be dangerous! Can you imagine making (and eating) cupcakes every day? Love all the patterns you are sharing! I really like the Tuffets. I'm going to get that one I think. I don't have any Schnibble patterns. love the Lincoln pattern will have to do that one too! 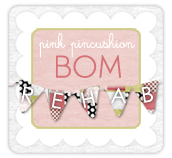 and the patriotic pin cushions are just tooo cute! 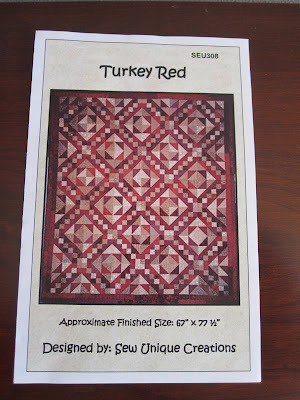 the Turkey REd quilt is awesome, a great way for me to use up those red scraps! oh how I would love that cupcake! You go girl! Make that Turkey Red quilt and if you have any questions feel free to email me! Thanks for posting the pattern - I love seeing our designs and things posted on blogs! Thelma, You can never have too many red and white quilts :) Go for it! If you start tonight you will have it made in a day...knowing you! I think you sew in your sleep...you are so fast! 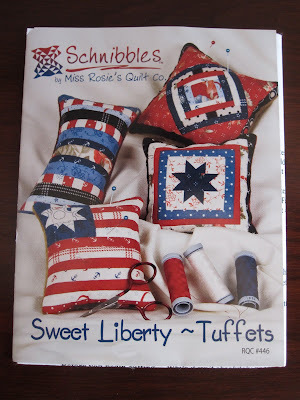 I have many of the Schnibbles patterns...but have yet to make one. I gotta get busy! I love red and white quilts. That is a gorgeous pattern.